This spiel gets every Press Your Luck fan riled up! As one of my favorite television shows in the world, right alongside Big Brother, The Bold and the Beautiful and The Real Housewives, I’ve studied PYL ever since I first saw it on the Game Show Network, now GSN, in 2002. The show originally ran on CBS Daytime from 1983 to 1986, and it was a spin-off of a short-lived game show from 1976 called Second Chance, also created by Bill Carruthers. I spent much of my youth learning the chords to the show’s theme song (Score Productions, 1983), as well as building models of the set. I was also up to date on the downloadable games as well, especially Big John’s Press Your Luck and Press Your Luck: Expert Edition, a fully customizable PYL game. With roughly ten years of immense knowledge of the show inside and out, I’ve used my newfound knowledge of 3d modeling to take PYL to a whole new level. I used to model the set with old cardboard boxes, poster boards and Christmas lights, and I taped my own episodes with the large Sony camcorder that my grandfather got me as a present in 2001. I believe I still have the tapes, and I plan to post the clips once I get my hands on a new converter box. I even covered the theme on a regular basis using my Casio keyboard, a microphone, my karaoke machine and my grandfather’s stereo. This was over ten years ago, so tape cassettes were still easy to find. As time passed, I became more computer-savvy. Fast forward to 2010, I designed this current set on PowerPoint. I began building the Big Board out of project display boards and Christmas lights, but due to unfortunate circumstances, it was never completed and was ultimately scrapped. Three years later, my covers of the pulsating theme are still popular on YouTube, and my modernization of the classic set has many fans ready for more. …which gave me my base layer. …which would house print-outs of the slides, featuring millions of dollars in cash, prizes and of course, Whammies. …finally giving the board its shape. The 6″ x 6″ game spaces are mounted, the lights are rigged…. …and we’re ready to go. …as they were to light independently from the logo and squares. …shining rather dimly in the middle of the Big Board. Tin foil was added later to brighten it. …with red cellophane on one side, and bubble wrap on other other for texture. …and the logo permanently took its place on the board. Squares. They are the basis of the show. They are what the gameplay is based on, and also they formed the shape of the classic set. Because of that, the simple shape of a square served as the basis of my entire design. PYL taped inside Studios 33, 41 and 43 at CBS’ Television City in Los Angeles. It was a simple design consisting of the Big Board, the rotating contestant island and a series of panes on either side of the stage. During the pilot episode, a star field hovered behind the studio audience, but this was replaced with the effect of blue windowpanes throughout the show’s actual run. The mood lighting on the curtains that outlined the stage would also change colors: red during the intro, Big Board rounds and closing, and blue for everything in between. The “Press Your Luck” set, blue during the second round of Q&A. The “Press Your Luck” set, changing colors in between rounds. 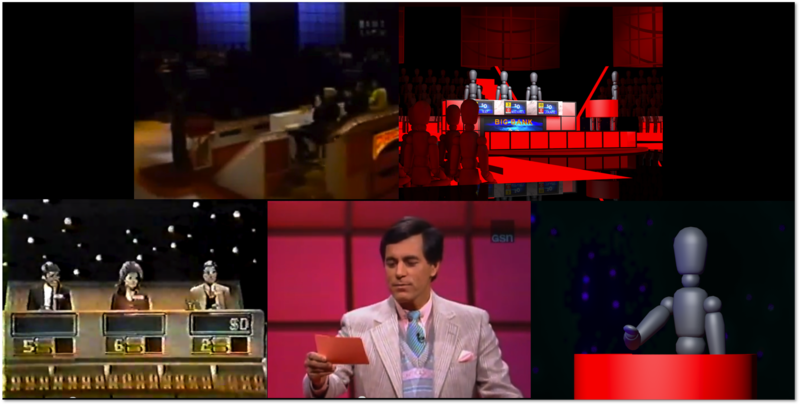 The “Press Your Luck” set, red during the first Big Board round. I took all of this, as well as other subtle nuances, into account when designing my set. Despite what was drafted on PowerPoint, the stage played a key factor in the set’s overall design. Taking pages from Deal or No Deal, America’s Best Dance Crew, Game$how Marathon and 80s Hollywood Squares, the audience is divided into risers, and a T-shaped catwalk juts out from the edge of the main stage, causing two pits on either side for the audience to sit in. This gives the very simple set more depth. The “Press Your Luck” set in its early stages, showing two of the five risers, plus the “mosh pit” on either side of the catwalk. A view from inside the Big Board, showing the remaining audience risers, as well as detail from alongside the catwalk and stage. My base color is always black as it causes the other details of my designs to stand out, so rather than having the stage change colors like the actual show, the set pieces change instead. Paying tribute to the old windows, I made giant panels, one for each riser, which have their own spotlight that changes colors with the rest of the set. These were also modeled based on the panes that lined the sides of the stage on the real PYL set. Not to be left out, I took the star field concept from the pilot episode and used that as the backdrop behind the host, replacing the real stage’s panes. (Top) Three-dimensional panes are hovering above and behind the audience risers, based on the original concept. The starfield from the pilot, however, was brought back and used as the backdrop for the host (bottom). The contestant island is loosely based on the 2002 GSN revival, Whammy! The All New Press Your Luck. 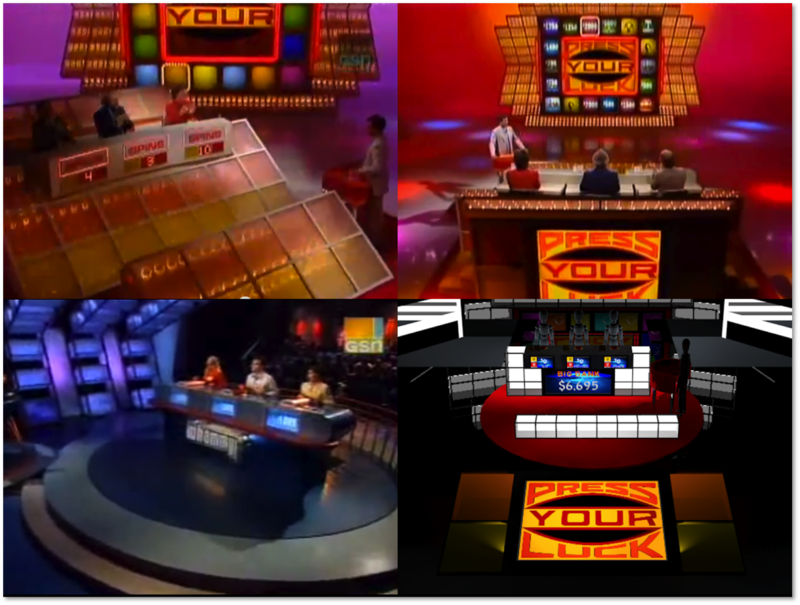 Divided into two tiers, the main tier has LCD screens that combine graphics from both PYL and Whammy!, and the bottom tier hosts the contestants’ own personal scoreboards, as seen on classic PYL. The original contestant island was large and elevated, and it featured a slightly smaller copy of the show’s logo on the back, as seen when coming in and out of commercial breaks. Nuances from both the 1983 and 2002 sets served as inspiration for my final design, paying homage to both generations of PYL. Also featured is the Big Bank, a collection of all the money lost from the Whammies. Originally from “Whammy!,” if the player lands on Big Bank on the board, they must correctly answer a difficult question on order to receive the total. Overall, this was exactly how my Big Board was built in my room, minus the LED panels that surround it. 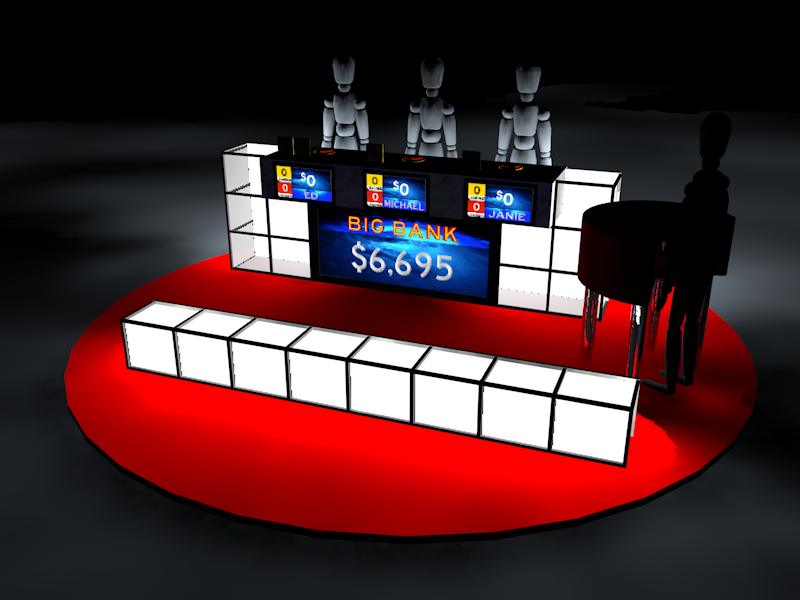 This CGI game board, however, is outlined in spotlights behind red acrylic, as LCD panels serve as the eighteen spaces. Lined with brick glass, the logo itself is displayed on a projection screen. 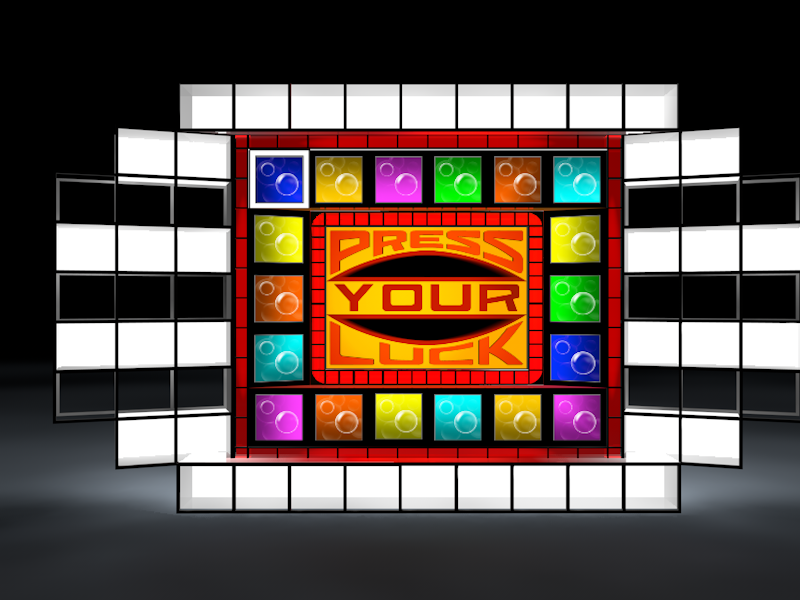 On the show, the “Press Your Luck” sign was replaced with feeds from one of the cameras inside the hollow black spaces inside it (I believe they represent the buttons pressed during gameplay). Here, the cameras are behind the skeleton of the Big Board, and the projection screen would alternate between the logo and the contestants at different points throughout the game. If this were real, that same projection would be used for the PYL logo at the base of the catwalk. -Rainbow colors is necessary as well like intros, commercial breaks, winner, etc. Is it okay if I can email you about my creation of the boards, dollar amounts, and everything else? Dude, I wish there was a better version of the PYL Expert Edition. And then YOU design it! It would be EPIC!!! i like the board. can you give me the instructions? also, its my favorite show since i was about 2. The instructions are extremely complicated, and impossible to explain here. This took months to do.